I read a lot of other peoples’ blogs, and do a lot of research on subjects that interest me. I’m going to start sharing some of the more interesting links each Friday – partly to help me keep track of the info, and partly because I think it might be interesting and useful for other people. Feel free to suggest related links in the comments! Our pigs are getting older (they’re now about 50 kg), so I’ve been reading a bit about how we’re going to process them. Other reading this week has been on examples of sustainable housing, homesteading, and reducing energy bills with solar cooking. Worming Pigs Naturally – Garlic and cayenne pepper are both supposed to be very helpful in deworming pigs and other livestock. I’m going to use a similar approach as a preventative measure with our pigs. Alternatively, you can use diatomaceous earth, garlic and rosemary. What Meat Do I Get From Half A Pig? – What are the cuts of meat you normally get from a pig, and which parts of the animal do they come from? What quantity of meat would you get if you bought a side of pork? This is very helpful for us in planning what will become of our pigs eventually. The time is getting nearer! Canberra’s Sustainable House – I’m already a follower of Michael Mobbs’ Sustainable House blog, based in Sydney (Chippendale), so it was nice to find another one based in Canberra. Closer to home, there’s another sustainable house web site based in Shellharbour – Our Eco-Home – although it hasn’t been updated in quite a while. It still has a lot of good local info on it, though. KiamaSphere – After a meeting with a number of local sustainability groups on Sunday, we all agreed to try to foster discussions in the KiamaSphere forums, to get all our upcoming events listed on the calendar (I think all the groups do this already? ), and to link back to KiamaSphere in our emails out to our groups. This should make it easier for anyone with an interest in sustainability events/issues to find out what is going on locally. I also keep a calendar of upcoming events here on Green Change. Book Depository – Very good prices on books, and free shipping to Australia. Hard to beat that! The Modern Homestead – Lots of great info on raising chickens, black soldier fly larvae (to feed the chickens), livestock, gardening, composting, etc. How To Freeze Eggs – to get you through the winter when your chickens stop laying. 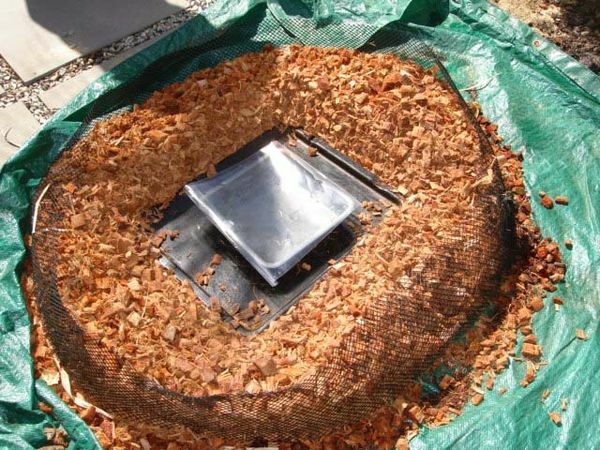 Solar Nest – A super-low-cost version of a solar oven that can be made for very little money plus a few scavenged materials. Efficiency can be increased by using more expensive materials, but the basic unit is perfect for use in large-scale emergency situations. What’s really cool about the basic wood+plastic version is that you could pack enough materials to make hundreds of the ovens into a very small cargo space, drop them into the disaster area, and assemble them onsite. It could also stop the widespread stripping of vegetation for firewood that often happens in poverty-stricken regions. Via the Solar Nest episode of the ABC Rural Bush Telegraph podcast. You might also be interested in reading about our tiny cottage. It is a very small house (252 sq-ft) which our family built in two months for about $7,000 and which we use only 3/4 cord of wood to heat in the cold windy mountains of northern Vermont. The house is about 100,000 lbs of masonry inside an insulated envelope. It has a barrel vault arched concrete (ferro-cement) roof. We’re snug as a bug through our long winters. @Walter: I had actually read about your tiny cottage, and it looks awesome. I think I’ll add it to next week’s list, since there were other tiny cottages I’d seen as well and they could go together nicely. I love reading about them, but find great difficulty in applying the concept in my own house! Still, it’s inspiring me to start shedding junk and reclaiming some of the space we’ve lost to storage boxes.